Bell & Ross debuts two watches, the BR03-92 Horograph and BR03-92 Horolum, in anticipation of Baselworld 2017, which begins March 23. Both new watches are ‘circle-within-a-square’ models in the aviation-instrument-style collectors know well from this brand. The first model, the BR03-92 Horograph (horo from the Latin ‘hora’ (hour), and graph (graphics), is made to recall airport clocks with its clean black dial layout, baton-shaped hands and minute-only baton-shaped markers. The contrasting white hands make them easy to read on the black dial, while the red-tipped seconds hand and red ‘100M’ notice offers a bit of color accent to the otherwise austere dial. And you won’t find a small date window on an airport clock. The BR03-92 Horolum takes the airport theme out to the tarmac by mimicking runway lighting. 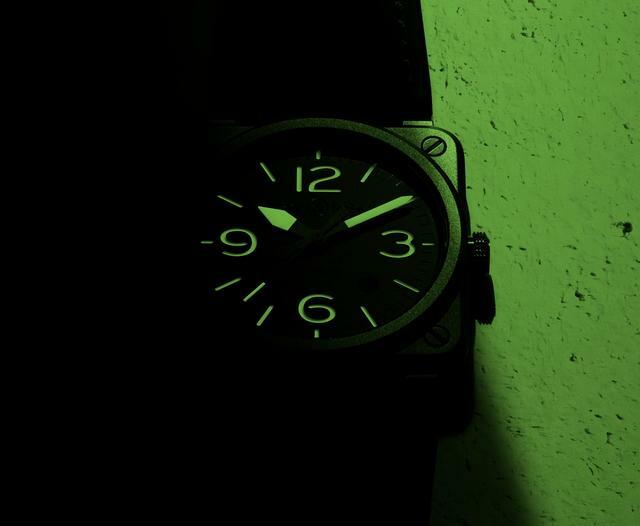 Its more familiar multi-layer 12, 3, 6 and 9 Bell & Ross dial utilizes long-lasting SuperLuminova C3 tinted green to allow the dial to be read well into the night. The so-called sandwich dial is the result of forming two superimposing metal plates. The grey upper section is cut away around the numerals and indices, revealing the luminescent coating covering the lower plate. Unlike the Horograph’s contrasting black dial, this model features a dial made of micro-blasted brass-rhodium to echo the look of the case. Like the Horograph, the Horolum also derives its name from Latin, with the same Horo as above, plus ‘lum’ from the Latin ‘lumen’ (light). Both cases feature bead-blasted steel 42mm cases with a matte finish that Bell & Ross makes by spraying tiny glass beads onto the surface of the metal to roughen it and give it a uniform grey tone. These two watches are the first for the brand to utilize this for one of its square steel cases. Inside each watch is a Sellita-based automatic movement. While the Horograph is an ongoing model, the Horolum will be made as a limited edition of 500. Price for both watches: $3,400.